Food Network junkies will find that a visit to Los Angeles leaves them spoiled for choice when it comes to restaurants that have been featured on the channel. 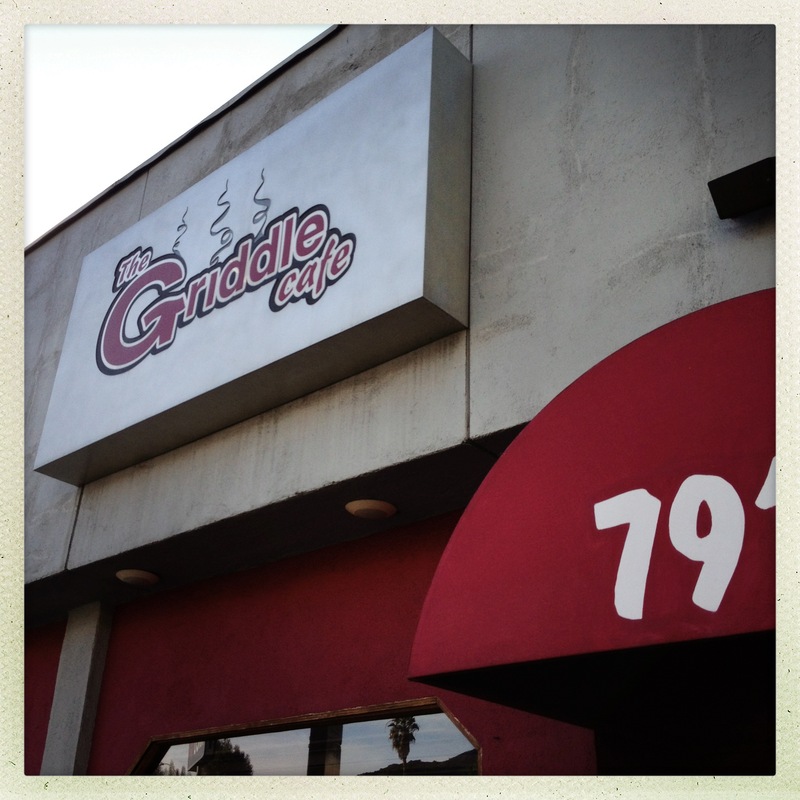 The Griddle Cafe is one of the places that I had seen featured prior to moving to Los Angeles and wanted to try. The place has a reputation though for having insanely long line for weekend breakfast. So much so that the tour buses point out the line as tourists as they pass by the Sunset Boulevard. Myself and a friend decided to brave the line early one Sunday morning. To our amazement, we didn’t have to wait more than a few minutes to be sat at the bar. I’m pretty sure that is because we got there nearly spot on their opening time because by the time we left the infamous line was in full force. I’m not usually somebody that loves sitting at the bar to eat a meal. I find it makes it more difficult to have a proper conversation with the person that came with you. Plus, I just like having my own space. At the Griddle Cafe, I didn’t really mind. 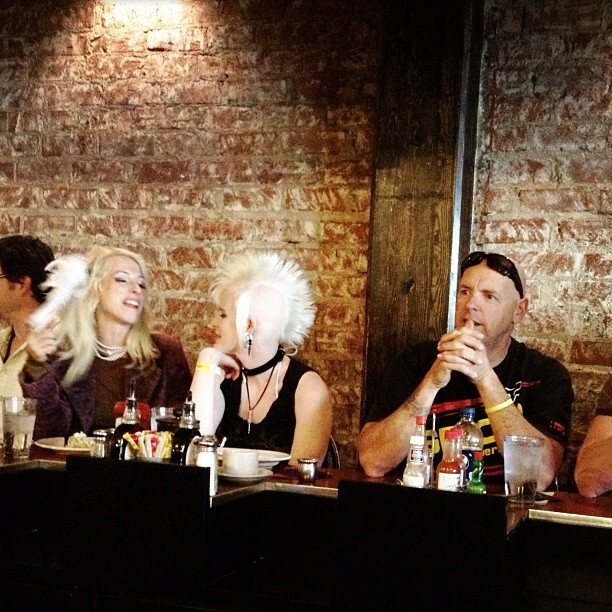 It felt as if sitting at the bar with the overly hip locals was part of the experience. 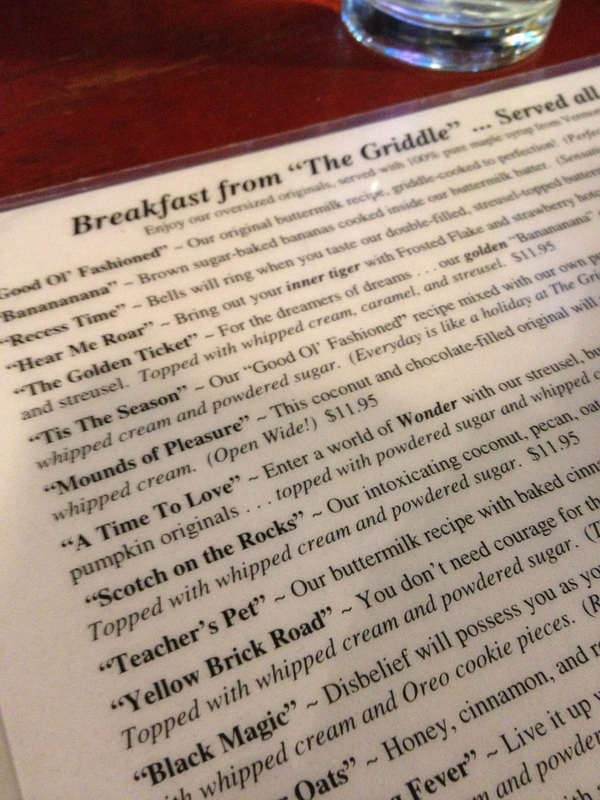 The Griddle Cafe has a full breakfast menu but I was there to try out their famously huge pancakes. 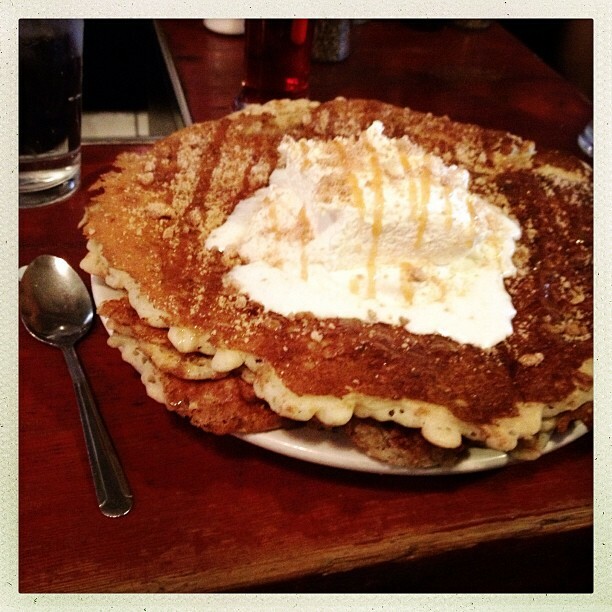 Combing through the pages and pages of drool-worthy pancakes, I finally decided on the the Golden Ticket pancakes. Brown sugar-baked bananas cooked inside a buttermilk batter along with caramel, walnuts and streusel and then topped with whipped cream? How could I pick anything else? I had heard that the portions at the Griddle Cafe were large but I truly wasn’t wasn’t prepared for when they arrived. They were scrumptious but dear lord, look at the size of those pancakes in comparison to the spoon! The Euro leftie inside of me couldn’t help but think that portions this large when others are starving is obscene. Then the foodie in me had to dig in. I made it maybe a quarter of the way through the dish before I had to tap out. No doubt this is a common occurrence because the Griddle Cafe has the take away box ready before I even had the chance to ask. No joke, I ate the leftovers for breakfast for the next three days! This entry was posted in Eating Out, Eating Out In Los Angeles and tagged Pancakes. Bookmark the permalink.